The rule of law is emerging as one of the most pressing issues of this century. It is a cornerstone of peace, security, justice and development. But as countries fall prey to conflict; as citizens demand greater equality and accountability; as institutions struggle to gain public confidence, new thinking is needed to overcome obstacles and exploit opportunities. 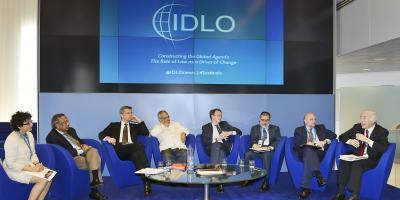 IDLO’s conference Constructing the Global Agenda. : The Rule of Law as a Driver of Change, held on April 2nd in The Hague, aimed to do just that. By convening judges, lawyers, diplomats, policymakers and academics, it explored ways to move the rule of law from the bench to the street. How, participants asked, can the rule of law become a daily reality? How does it further nation-building? How do we create a culture of justice, and make it an integral part of the post-2015 development agenda? “Fundamental rights require two things,” senior Dutch Foreign Ministry official Rob Swartbol stressed in his keynote address. “First, building trust among ordinary people. And second, making sure that they have access to justice.” In much of the developing world, justice is often lacking. At the conference, Iranian human rights lawyer and Nobel Peace Prize Laureate Shirin Ebadi blamed patriarchal cultures for denying it to women and sexual minorities. Her presence strongly animated the Gendering Justice panel, which discussed legal barriers for women in accessing formal justice systems, and the ingrained prejudice they face from informal ones. But in the developed world too, the provision of justice can be patchy. Here, it was remarked, income (rather than gender or sexuality) may act as a segregator. “We need to look beyond the concept of formal equality to substantive equality,” IDLO Director-General Irene Khan said. “In a court of law where you put a rich man and a poor man together, the result is not necessarily fair even where there is rule of law.” Judge Ann Williams, from the US Court of Appeals for the Seventh Circuit (Indiana, Illinois and Wisconsin), spoke of distributing funds left over from class action settlements to NGOs, in order to enhance access to justice in poor American communities. Her intervention came as part of the Making Courts Work for People session. Joining her was Kenyan Chief Justice Willy Mutunga, who has been strongly promoting judicial reform in his own country. Opening the Peace, Security and Justice segment of the conference was former President of Timor-Leste, José Ramos Horta. Mr Ramos Horta discussed rule-of-law and nation-building efforts across post-conflict societies. “If you steal a cow, you go to jail,” he said, outlining the challenges. “[But] If you milk a country of hundreds of millions of dollars, you don’t.” Mr Ramos Horta, also a Nobel Peace Prize laureate, is now United Nations Special Representative in Guinea-Bissau, where he is seeking to apply lessons learned in his Timorese homeland. For his part, Polish Undersecretary of State for Foreign Affairs Artur Nowak emphasized the role of justice in ‘making the world more human’. For this vision, he credited fellow Polish jurist and UN diplomat Manfred Lachs, whose bust was unveiled in The Hague last week. Constructing the Global Agenda took place as IDLO opened a branch office in The Hague, in an effort to extend its operational base. “I am delighted that IDLO has finally become part of The Hague’s international scene,” Mr. Swartbol stressed, describing the Organization’s arrival as 'another jewel in the crown'.